Romantik i Marais: Vackert lugnt och ljust!Plus mest bekväm säng! Beläget i Marais, ett kvarter från Place des Vosges och två minuter från Picasso-museet, är denna härliga lägenhet säker på att bli ditt hem-away-from-home i Paris. Ligger på andra våningen i en mycket lugn och charmiga 17th century byggnad, är det lätt nås genom en bred trappa. Lägenheten visar den högsta standarden för kvalitet och komfort. Det kommer att charma dig med designmöbler och inslag av traditionella franska antikviteter. Stänk av dramatiska färg positivt energi inredningen och den nyligen lackeras trägolv glans. Nådig och genomtänkta bekvämligheter ingår hela. En luftig och soliga 520 kvadratfot utrymme, vackert renoverade och möblerade. I vardagsrummet finns tre stora franska fönster som vetter mot en innergård. Det finns en Ligne Roset soffa som lätt blir en bekväm säng för två. Två fåtöljer och en ottoman accent rummets färgsättning och modern design. Vackra, eleganta lampor ger gott om ljus för läsning och andra aktiviteter. Kabel-TV, stereo och CD-spelare är bekvämt beläget för användning i rummet. Trådlöst internet i hela. Sovrummet har också en stor fransk fönster som vetter mot innergården. Den Ligne Roset Sängen är queen size med en vadderad sänggavel (perfekt för att läsa i sängen) och en fast madrass. Sängkläder är 100% bomull och kuddar och täcke är mycket bekväma. Den klädkammare ger gott om lagringsutrymme. Köket är stort och har en antik bord med matchande stolar. Nya bänkskivor, skåp, keramik handfat och salvia gröna golvplattor skapar en underbar miljö för matlagning och äta. Fullt utrustade, köket finns en diskmaskin, tvättmaskin / torktumlare, mikrovågsugn, brödrost och kaffebryggare. Badrummet har en inglasad dusch och badkar. En handdukstork, hårtork och gott om plats för dina saker lägga bekvämlighet till detta rum. Denna underbara lägenhet är idealiskt beläget på rue Saint Gilles, ett kvarter från Place des Vosges i hjärtat av Marais, är detta Paris så ofta ser idealiserade i filmer och på vykort. Place des Vosges, den äldsta och en av de vackraste torgen i Paris, är en favorit för lokalbefolkning och turister - en plats att koppla av, promenera och njuta av skönheten i staden. Marais och närliggande Place de la Bastille är hem till några av de viktigaste personerna och händelserna i Paris historia. Victor Hugo gjorde sitt hem på nummer 6 Place des Vosges och Balzac och Dumas bosatt i Le Marais. Picasso-museet, i närheten på Hotel Sale, är hem till världens mest betydande samling av hans arbete. Musée Carnavalet på rue de Sévigné är en av de mest intressanta av Paris museer. Det illustrerar historia och utveckling av Paris fram till idag. Det livliga nattlivet i Marais är levande med sina restauranger, klubbscen, konserter, kaféer och barer jazz. Mindre än en 10-minuters promenad tar dig till året runt program för opera och balett på Opera Bastille. Du kan enkelt gå till Centre Georges Pompidou, Louvren, Forum des Halles, Notre-Dame, och många andra Paris landmärken. Varje torsdag och lördag morgon, det är den stora utomhus marknaden på Boulevard Richard Lenoir och en välsorterad, litet snabbköp, G20, har öppnat på rue Saint Gilles. Inom området finns många underbara specialitet mataffärer och bagerier. Tunnelbanelinjer: Om ett kvarter från Metro: Chemin Vert (linje 8). Ca 5 minuters promenad till Metro: Bastille (linjer 1/8/5) eller tunnelbana: St Paul (linje 1). Vi har agenter i Paris finns att lösa eventuella nödsituationer bör de uppstår. Kombination badkar / dusch med rörlig duschmunstycke. This apartment is in a great location. It is quiet, spacious and comfortable. The four windows overlooking a courtyard make the apartment bright and sunny. The walk-in closet is a plus for storage. No need to live out of your suitcase. The separate bath room and toilet is very convenient. The kitchen has everything needed to cook and /or eat take-out. There are several really good restaurants nearby. Although you are on your own arriving and leaving, Joëlle is thorough in explaining how everything works. The local manager was also available for questions and help if needed. Only one small negative, unlocking the door is a challenge at first, but after several times it becomes much easier. We were happy spending two weeks here and would certainly return. Wonderful apt in a wonderful location! My husband, son and I had a lovely experience. The apartment is well-equipped, very clean and very comfortable, and the location in the Marais couldn't have been better or more convenient. Our host and our contact, Florence, supplied so much helpful information about the neighborhood, about Paris, places to eat, and things to do that we couldn't go wrong. We hated to leave! 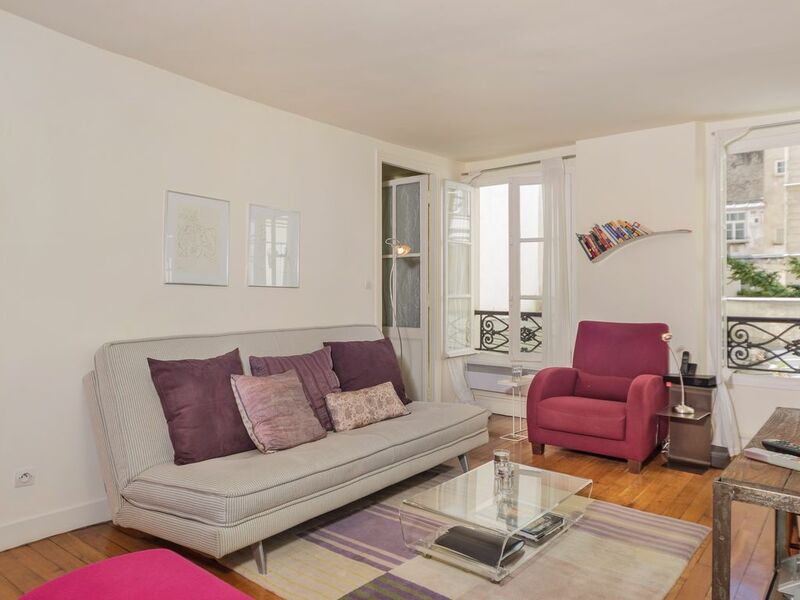 Perfect apartment in the Marais area. This was a perfect apartment for our short stay in Paris. The apartment was clean. The beds were very comfortable. It’s near the metro & very central. Joelle was very helpful with any questions I had before. They were accommodating when I asked if I could leave my luggage earlier which was very convenient on that first day. It was me & 2 of my kids ages 14 & 18. We were out most if the day but when we got back, it was a comfortable homey feel to come back to, much more preferred then a hotel. Thank you Joelle!!! We found this apartment to be clean, comfortable, well equipped, secure and in an ideal location. The neighborhood was charming - near Place des Voges and easily accessible to then Metro. The 2 smaill markets across the street were great, the local bakeries were terrific as were the small retuarants (loved Cafe des Musees). The communication with the owner and managers and the information that they provided was terrific making checkin. and checkout very smooth. We’d definintely stay again! Oasis in the heart of the Marais. This is a lovely comfortable apartment in an excellent area. The apartment is bright with three windows overlooking the courtyard from the living and kitchen area and one from the bedroom. It is a perfect place for exploring the Marais and all parts of Paris. Two Metro stops are close by. The G20 Grocery Store across the street is very convenient. There are Boulangeries a short distance where they bake baquettes and pastries several times a day. The apartment is near Place Vosges and several less known squares and surrounded by restaurants and shops. The apartment is well furnished with a comfortable couch and two lounge chairs. The kitchen is well equipped and has a new stove. The bed is extremely comfortable. The walk in closet and storage area was great for storing suitcases and hanging clothes. The washer and dryer in the unit was a plus. Joelle and her team are responsive and reliable and had good information about the area. They were there to meet me when I arrived and walked through the keys and other details. They also made sure that I knew how to arrange for an English speaking taxi to the Airport and provided contact information. There are lots of Paris tour books in the apartment left by fellow travellers which are excellent for planning outings. There is also a well stocked shelf of English novels which was perfect for enjoying with wine at the end of the day. I loved my stay in this quiet and wonderful apartment. After busy days of touring Paris it was nice to come back to the apartment, open the windows and enjoy this oasis in the heart of the Marais. Great location, clean and romantic. Safe environment, romantic place, well kept and clean. There is an extra $30 dollars fee per stay per person for more than 2 people. I will consider two nights stay if it works well with the schedule. I also reserve the right to not take three night stay if it is in the middle of a possible longer stay.